Samsung’s been taking its sweet time in bringing support for languages other than English and Korean to Bixby Voice. But it looks like the company has quickened its pace; it added Chinese support to Bixby Voice recently, and is adding another language today. Based on screenshots uploaded by a Twitter user, Bixby Voice should now support Spanish (US), bringing the total count of supported languages to four. 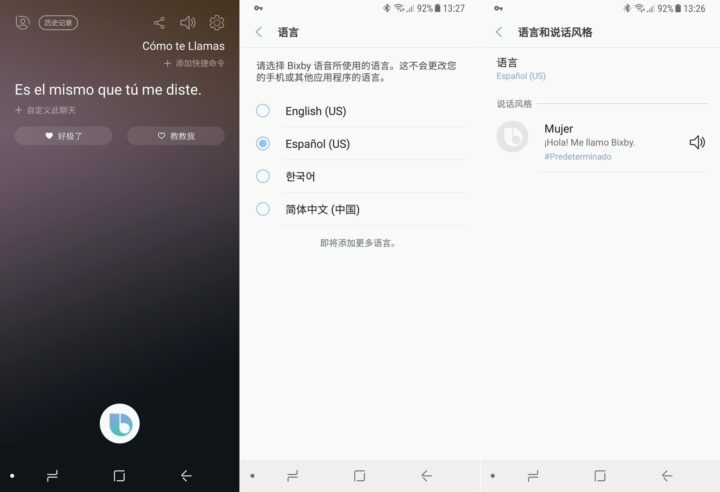 Given Spanish is the world’s second-most spoken language, it’s not surprising to see Samsung is adding it to Bixby Voice after Chinese, which has the highest number of native speakers. It’s unclear if Samsung is rolling out Spanish support to all users, though, as it hasn’t made any official announcement yet. We’ve checked our phones and can only see Korean and US English for now, so it’s possible the rollout will commence in the US before making its way to other countries, similar to how software updates are rolled out in a phased manner. To see if your phone supports Spanish, open Bixby and go into its settings (by clicking the three-dot button on the top right), scroll down and tap on the Language and speaking style option, followed by a tap on the Languages option. We’ll update this post once Spanish support becomes more widely available, and if your handset already has it, do let us know how well it works by leaving a comment. Llevo casi 1 año con el Note8, ahora resulta que te ofrecen y meten por todos lados la propaganda para que te instales el Fortnite que ni me interesa. Pero sigo esperando Bixby en Castellano! Es una vergüenza que no saquen a la venta un producto terminado!! Dejan un botón inutil en el celular, opciones inutiles, y no tienen un grupo de desarrolladores que en mas de 1 año hayan podido agregar otro idioma!. quando vai chegar em portugues br???????????? I have G950 (TPA) just updated Bixby and it does not support spanish yet. Yesterday i got an update and now it understands my words better! Cool! Could you please tell us exactly what this is? Don’t even have the option for Chinese – think its device specific these new languages unfortunately. Continuing to doubt that UK, AUS and other English will be coming to be Bixby anytime soon!